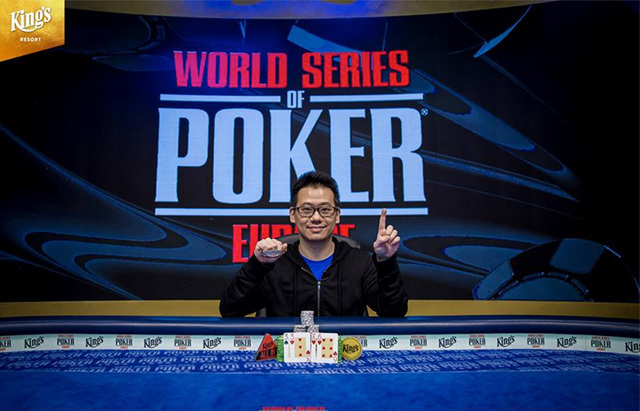 Anson Tsang wins World Series of Europe Event #7 (€2,200 PLO 8-Handed) for €91K and his first gold bracelet. It was a roller coaster ride for Hong Kong’s Anson Tsang at the final table of the World Series of Poker Europe Event #7 (€2,200 Pot Limit Omaha 8-Handed). In the end, Tsang weathered his setbacks, eliminated three of the final eight players and ramped up the aggression to build a commanding chip lead that would carry him to his first WSOP gold bracelet and the €91,730 first place prize. It didn’t take very long before the first elimination of the day occurred. Final table chip leader Ilya Bulychev opened the pot holding only to be three-bet from the small blind by Sweden’s Alexander Norden and his . Bulychev made the call and the pair saw the flop of . First to act, Norden shipped the remainder of this short stack only to be snapped off by Bulychev who flopped the full house. Only an ace would save Norden’s tournament, but the turn and river was of no use. Norden collected €8,886 for eighth place. Denmark’s Gisle Olsen would only last another ten minutes himself. Tsang opened the cutoff with and Olsen in the big blind three-bet with . After Tsang called, the flop came . Tsang flopped trips and all the chips made their way into the pot with Olsen at risk. The turn was the and the river was the giving Tsang a full house and the hand. Olsen bowed out in seventh place for €11,469. After two lightning fast eliminations, it took over an hour for the next player to fall. Hokyiu Lee from Hong Kong raised from under the gun with only to be three-bet by Bulychev on the button with the . Lee made the call and the flop came . Lee fired first, betting pot putting Bulychev’s overpair to the test. Bulychev stuck in the remainder of his chips and Lee called, barely covering Bulychev. The turn came and the river the leaving Lee unimproved, doubling up Bulychev. Lee had less than a big blind remaining after the hand. His tournament ended the very next hand in sixth place for €15,134. Another hour of action passed before the next all-in confrontation. Jason Gray from the UK opened in early position with the and when folded back to Ludvig Sterner’s big blind, he made the call. The flop unfolded and Sterner led out. Gray put in a raise, Sterner shipped and Gray quickly called. The turn gave Gray the nut flush and ended the hand, leaving Sterner drawing dead to the river. Sweden’s Sterner headed to the rail €20,405 richer for his fifth place finish. The cash officially puts Sterner over $100,000 in career live earnings. After losing a couple of critical pots, China’s Quan Zhou was crippled and at risk holding against both Tsang and Gray. After the flop of Tsang bet Gray out of the pot and showed down for top set. The turn came the leaving Zhou without outs and as the hit the river he was headed for the cashier to pick up his €28,100 payday for fourth place. After a short break, the final three got back to business. After an open from Bulychev, Gray three-bet from the small blind. Bulychev shoved his stack. Gray made the call and the cards were on their backs. Gray held the while Bulychev turned over the . The board ran out giving Bulychev the nut flush. Gray fell in third place for €39,508. It was his second cash of the 2018 WSOPE. Heads-up play began with both Tsang and Bulychev close in the chip counts, however, within a matter of hands Tsang would extend his chiplead and eventually end the contest. On the final hand, Tsang raised his in position and Bulychev made the call with . The flop came giving Tsang a set and Bulychev a flopped straight. Tsang c-bet and Bulychev check-raised, inviting a shove by Tsang. Bulychev snap called and needed to fade some outs. The turn was the giving Tsang some flush outs. The river brought the delivering Tsang the nut flush and the victory. The Russian Bulychev received €56,684 for his runner up finish. Tsang secured his first WSOP gold bracelet and €91,730 with the win. It was Tsang’s fourth cash of the 2018 WSOPE and propels the pro to over $2.4 million in career recorded cashes.